The very ordinariness of this pattern makes it special. So many patterns have Pictures! Of Exciting! Glamour! And! Hilarity! that finding one where the woman seems to be waiting for her husband to settle Saturday afternoon's golf foursome so that they can get back in time to run the babysitter home is somehow more of a coup. "Did I take the laundry in off the line? It looked like rain. I have to call Joanie's orthodonist tomorrow and reschedule her appointment. I bet I have spinach in my teeth; better keep my mouth closed until I can get to the bathroom. What's taking Angela so long in there? Oh, dear, Ted really is losing his hair, but I'll let his mother bring that up. I should ask Sheila for the recipe those stuffed mushroom canapés … I bet it's packaged salad dressing, that sauce. Someone's going to have to drive Keith home again; we should leave or else it will be us. Maybe I'll grab another one of those mushrooms before we go. " except the part about, you know, her feet were gnawed off by a bear or something. besides the mundanity (it’s a word, right?) of it, that’s sort of a nice dress. This is what I love about Marian Martins (or is this an Anne Adams? The hair looks more Adams.) I don’t say “schoolteacher” in a bad way – I just mean that sober, reasonable dresses for sober, reasonable people are also fun to sew. It has pockets for all those detention slips! I actually like the dress, but then, I was a schoolteacher. double post…my address was incorrect I guess. 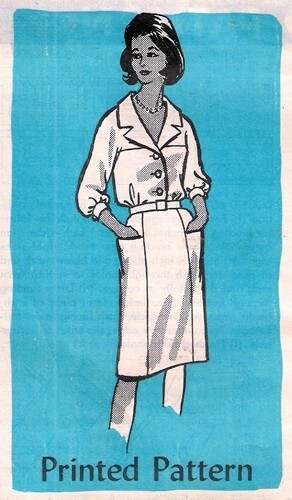 This pattern demonstrates another, yet little discussed, use of pockets. In additon to cigarettes, lighter and lipstick, it’s a place to put your hands while you wait for men to finish doing whatever it is that takes men so long to do. I do admire the simple practicality of this dress. “…but I’ll let his mother bring that up…” nearly killed me. Thanks! Every day should have a moment of unexpected hilarity. I love the dialogue! I love that this is a “real woman” dress. I could see myself wearing this while I’m out running errands. The pockets are a perfect place to stash the “To Do” and shopping list. Love the inner monologue… thanks for your beautiful blog. It looks like a nurses uniform. I think she’s getting dressed down by her supervisor because she has on a necklace and rebelled against all that is good and holy and didn’t bother with her cap. It’s hard to see from the drawing but her fists are clenched into tight little knots. and yes…the pun was intended. lol I agree with you Laura, the first thing I thought was nurses uniform.